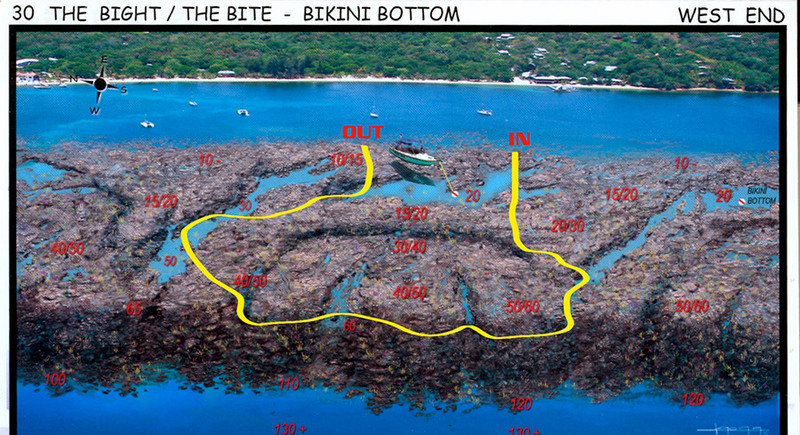 This Dive site is famous for the huge barrier reef and the variety of marine life. 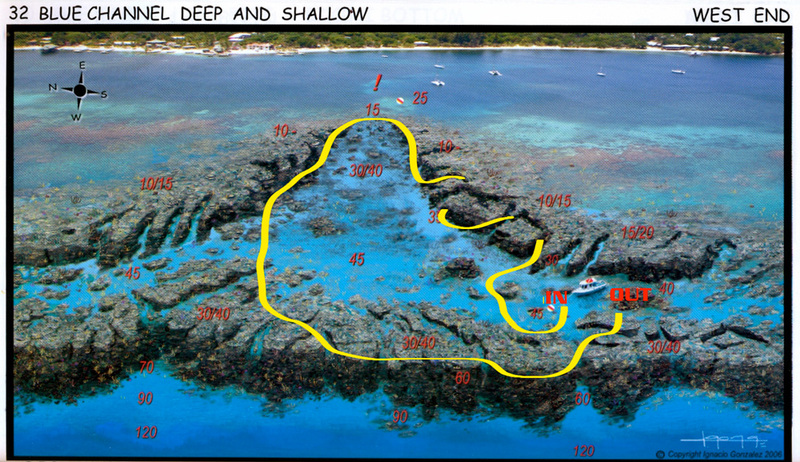 Is a shallow dive with a maximum depth of about 20 meters/ 80 Ft. Turtles and grouped are common in this area, and this dive site is capable for beginners divers as well. Visibility is normally around 25 or more meters! 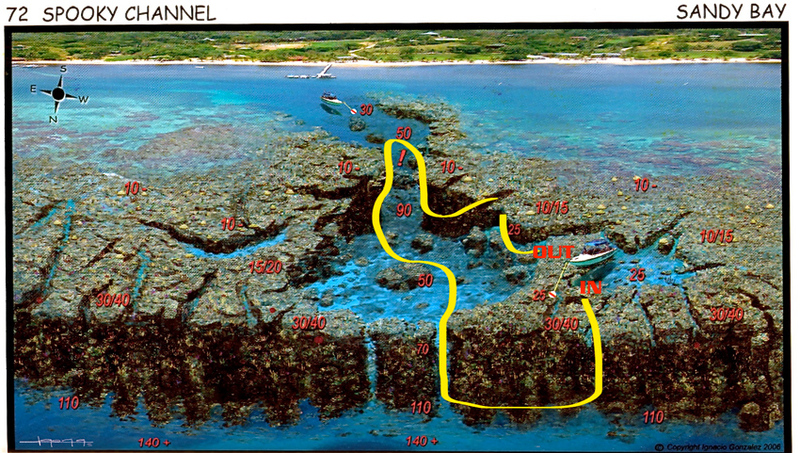 This dive site is located in the West Bay Area , is a gentle slop reef with abundant marine life. Horse eye Jack are often seen here and amazing eagle rays are also common on this dive site. 3 minutes boat ride from the Henry Morgan Resort make the dive site capable for expert and beginners. 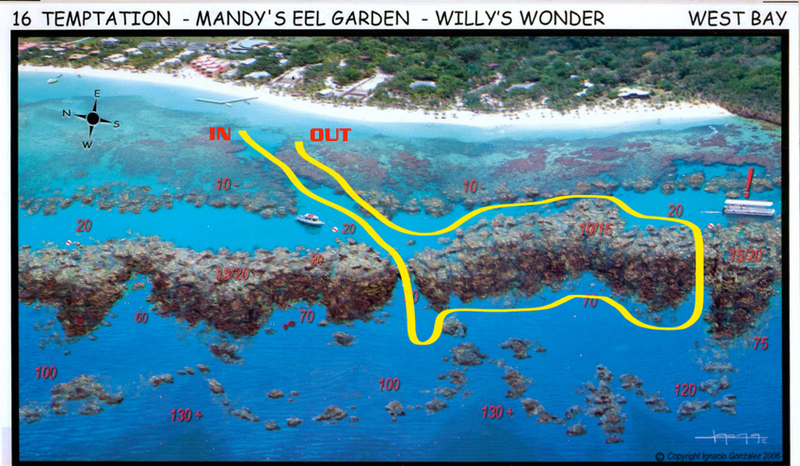 One of the most popular and beautiful dive site in the Sandy Bay Area. 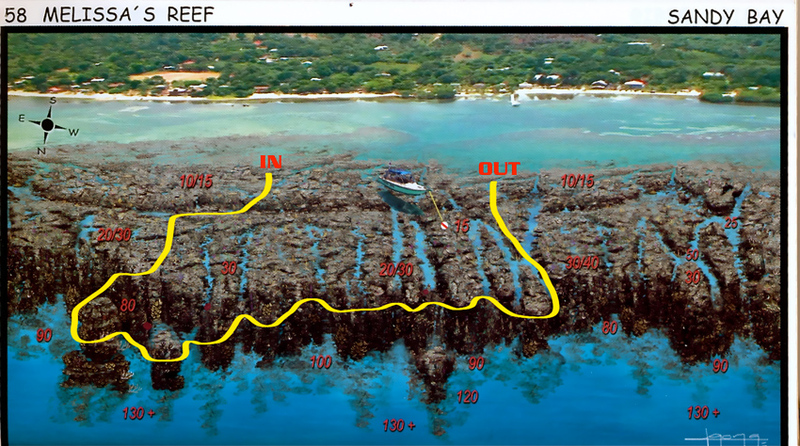 This reef is a concentrate of marine life of any kind, and sea horses are ofter seen in this area. 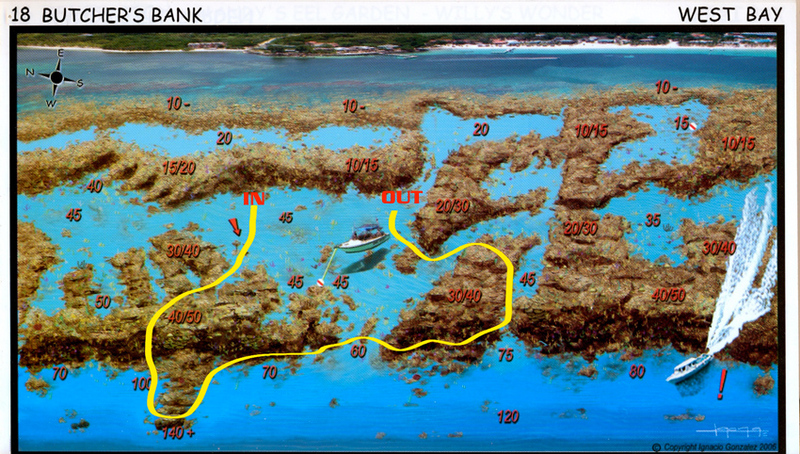 Sometimes some current might be present in this dive site, so divers are recommended to have good buoyancy control. 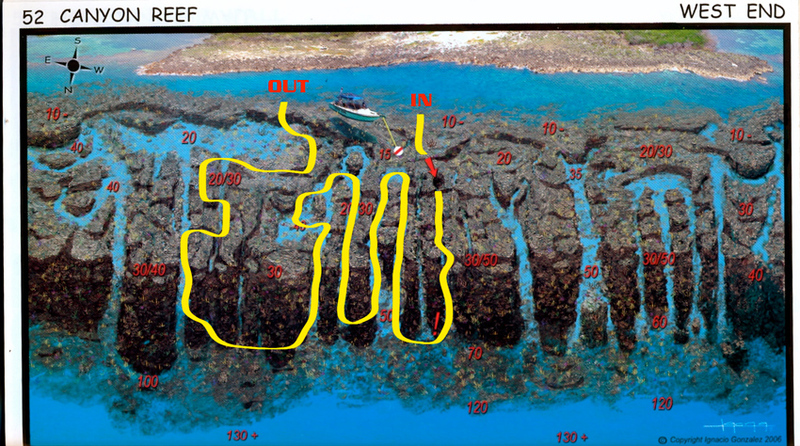 Small cracks and little canyons proved shelter for giant King Crabs and lobsters . This dive site take name because os some typical pillar coral formations, a huge wall and some impressive drop of makes this dive site one of the top ten in the area. Some stationary sea horses can be seen in some season, and nurse shark are been seen also. The wall outs West Bay is considered one of the most interesting on Roatan, with several canyons and crack where groupers , dog snappers and barracuda can hide. This dive site is usually performed as drift dive and some current can be found. Giant barracuda are common and sometimes eagle rays appears. Cara a Cara, also known as Marco’s Place is a huge coral reef located on the south side of the island. Is famous house a big family of Caribbean Grey Reef Sharks that are stationary on this reef. Considered one of the most trilling and exiting dive in the Caribbean. Strong current can be found and this dive site is located almost 2 miles offshore , so sometimes see conditions might be rough. One regular dive with our crew is mandatory for safety reasons. 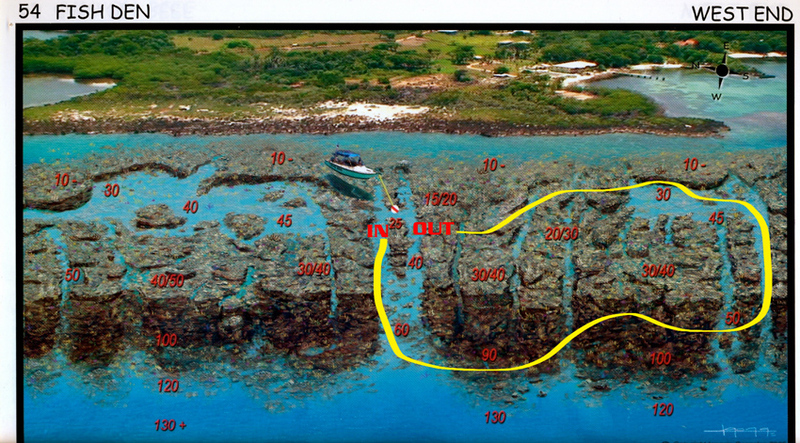 This dive site is located right in between West Bay and West End. 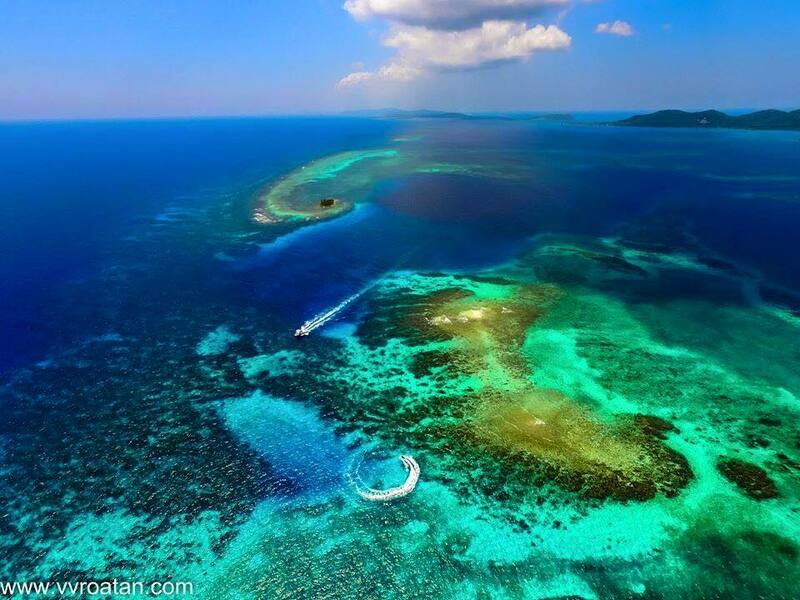 This beautiful reef is habitat of severa species of reef fishes and seas turtles are common on this area. 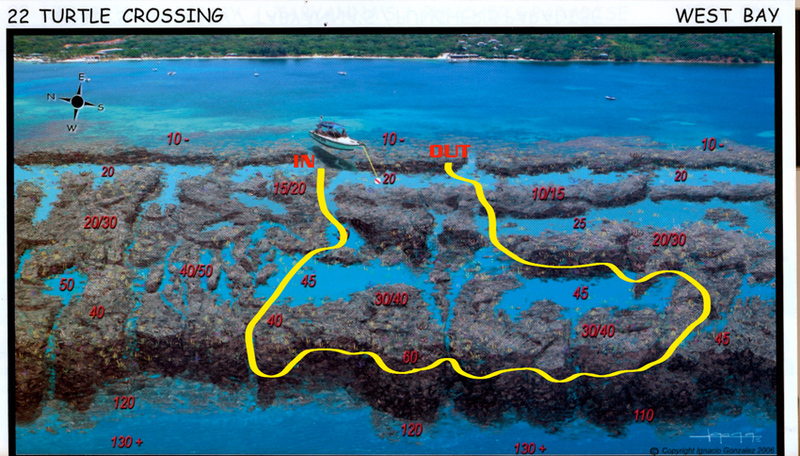 Capable for beginners is a prefer dive site to enjoy coral formations and gentle slopes. 10 minutes by boat to the north , located close to West End town, this dive site is perfect for expert and beginners, a huge and deep wall that can be explored in about 45 minutes. Boat traffic can be present, so a safety surface masker is strongly recommended. Schools of horse aye jacks can be seen and sea turtles are common on this dive site. 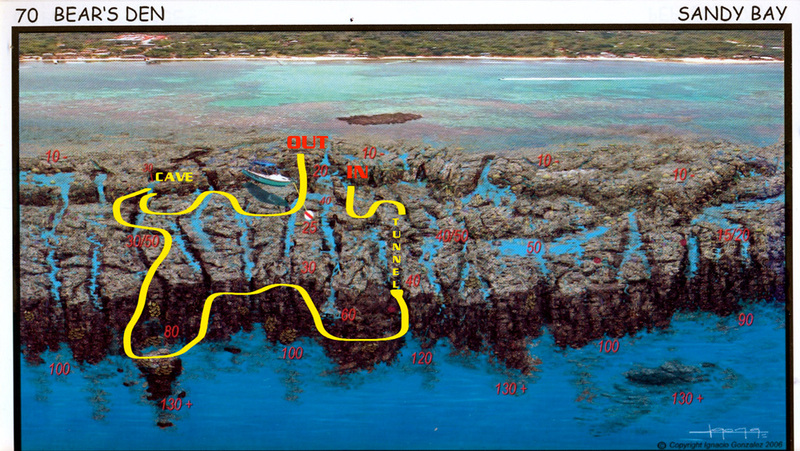 This dive site is famous for a long passing through in the reef and a cave. Both can be visited. A dive light and some experience are necessary to explore the cavities. Big groupers are usually common in this area, they are use to divers and often they follow divers along their dive. Probably one of the most peculiar dive site in Roatan, this huge crack in the reef offers an incredible experience of lights and shades. Visibility sometimes can be poor, but the coral formations of this dive site are so impressive that people always are fascinated by this dive! 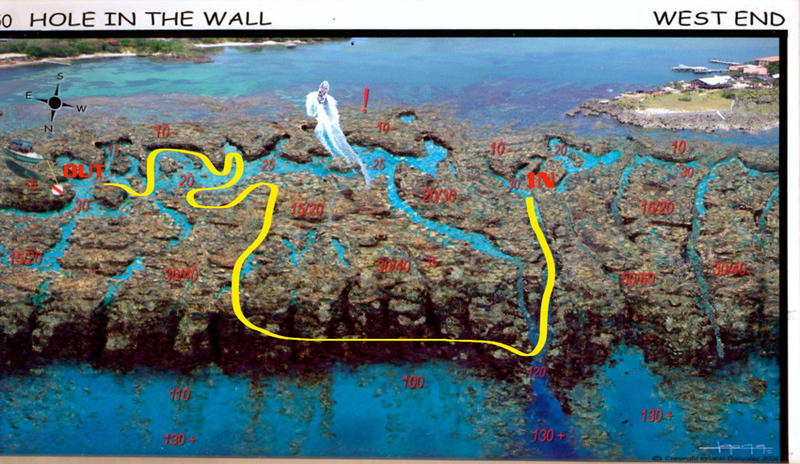 This wall is one of the divers favorite dive, as corals are so big and heath and marine life so abundant. The wall drop deep in to the blu, so is important to be careful about the deep, as the amazing visibility sometimes might bring divers deeper then they planned to go. Sea turtle and Gian barracuda are common on this dive site. 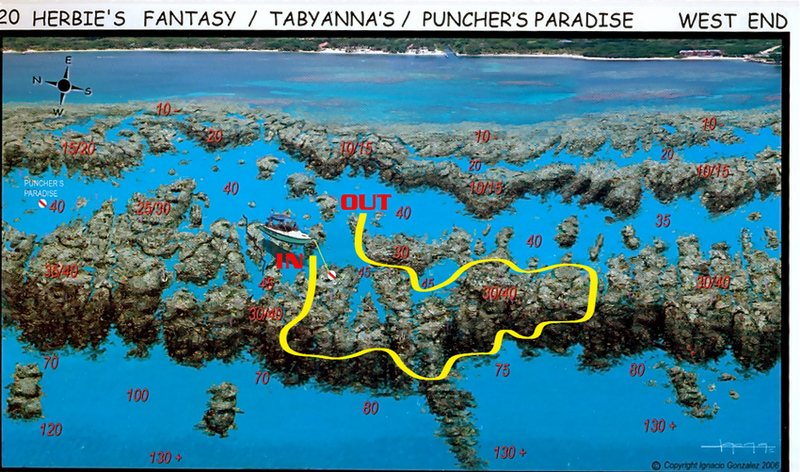 A nice and easy dive located 5 minutes from West Bay Beach. capable for beginners and photographer that wish to spend time discovering course and micro marine life. This dive site is well know for its spectacular formation and its incredible visibility. Therefore must be done with attention as divers might be go deeper then planned. deep might be a concern for this dive, so be sure to have a dive computer. In the shallow area, canyons and caves can be explored with a professional dive guide. 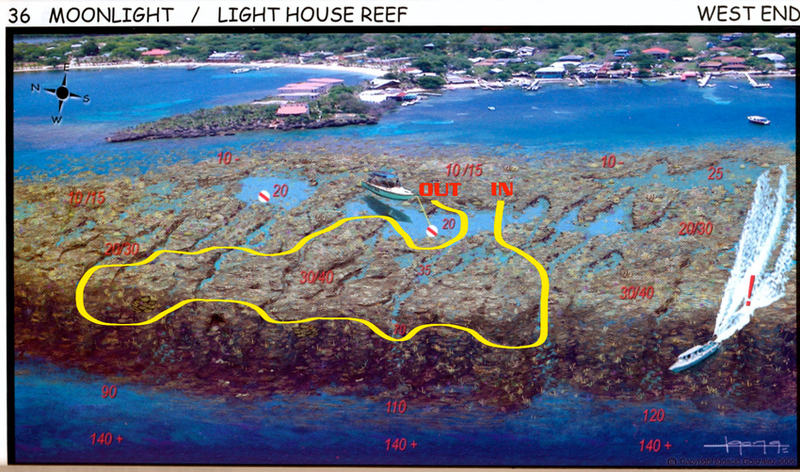 Undoubtedly the most loved dive site in Roatan, this huge reef extend fro. 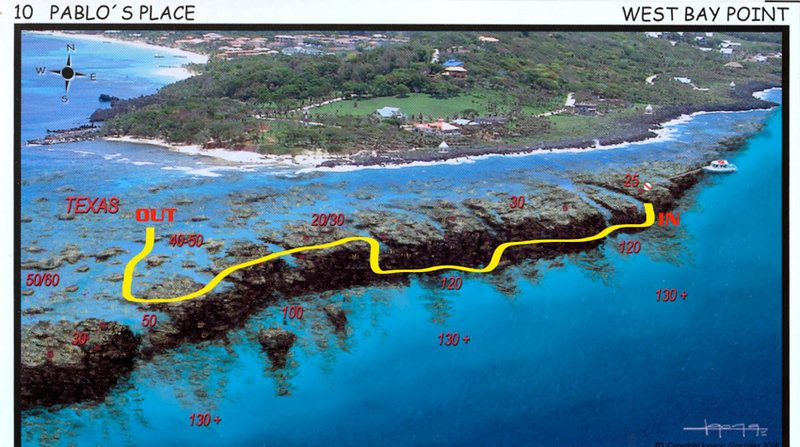 the west pick of Roatan for about 2 miles. The coral reef is absolutely outstanding and the abounded marine life is unique. 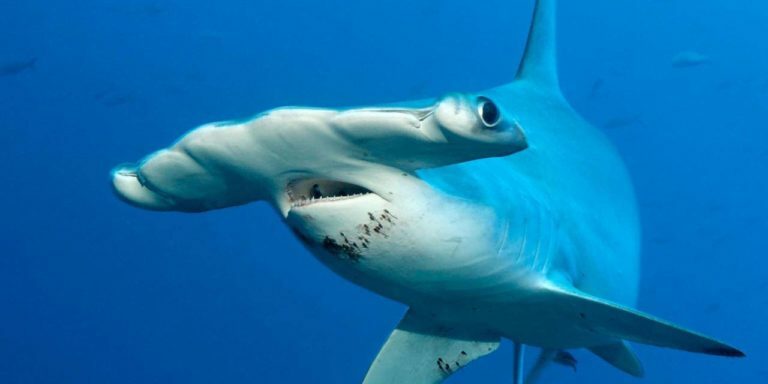 Sometimes hammerhed sharks can be seen coming for the big depth! 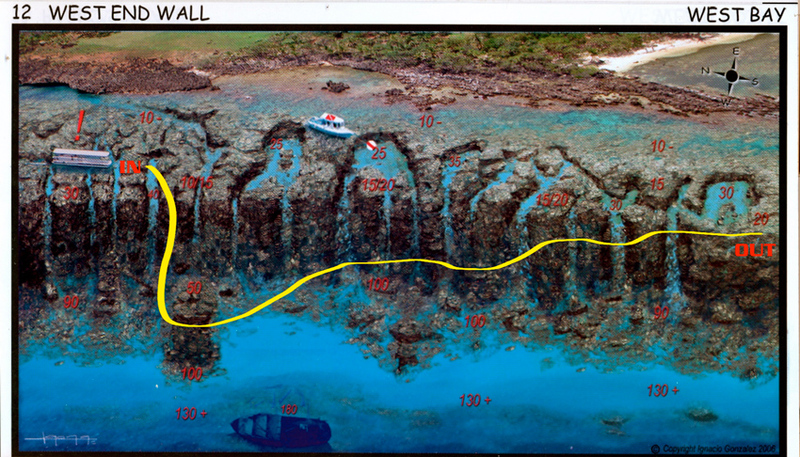 The impressive wall from to more then 1000 ft and the currents brings to the reef a huge quantity of pelagic fish. sea conditions and currents could be rough , so this dive is suggested for expert divers depending on sea conditions. Our favorite , within the Roatan TOP 5! This nice wall is characterized by a beautiful coral reef formations and a numbers of cracks on the reef, shelter for many fishes and creatures. sea Horses are often seen and groupers are common in this area. capable for beginners and expert divers! 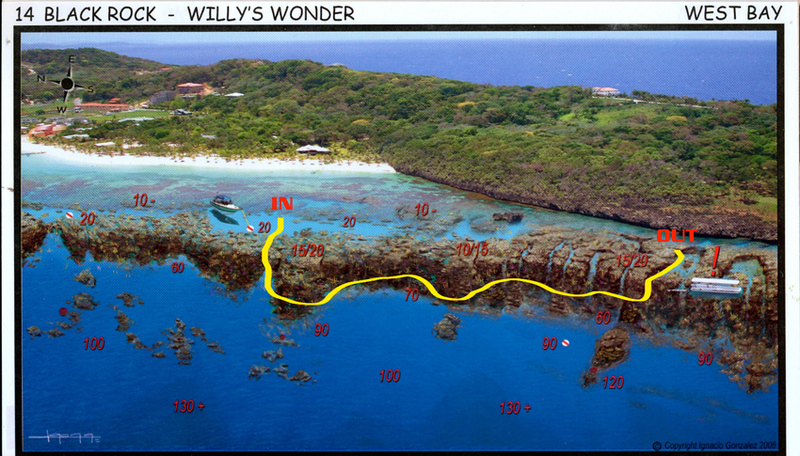 This is one of the most popular dive site in the area, people comes from all over the Bay Island to dive here. 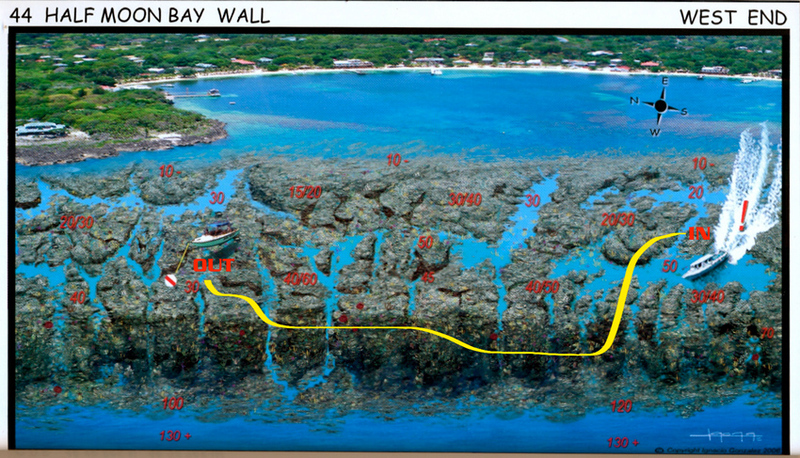 Is a huge and amazing wall on the west end or Roatan, plenty of canyons and a huge variety of marine life. Sometimes the current might be medium to strong at the end of the dive, and a marker buoy is strongly recommended . A drift dive most of the divers want to to twice! 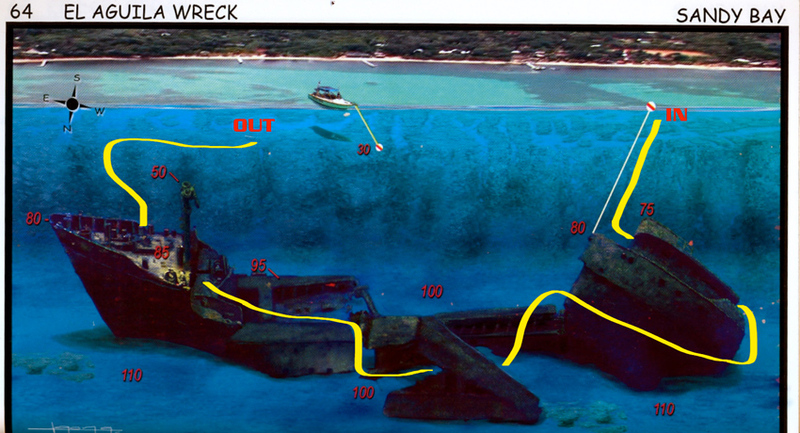 El Aguila is an old wreck that has been sucked for diving purpose in 1997. Is 150 feet long and 110 feet deep. Is extremely photogenic , and the abundant life that now lives the wreck make this dive site a must for all divers in Roatan. Due to its depth , Advance dive is required and one dive with our crew is also required for safety reason. 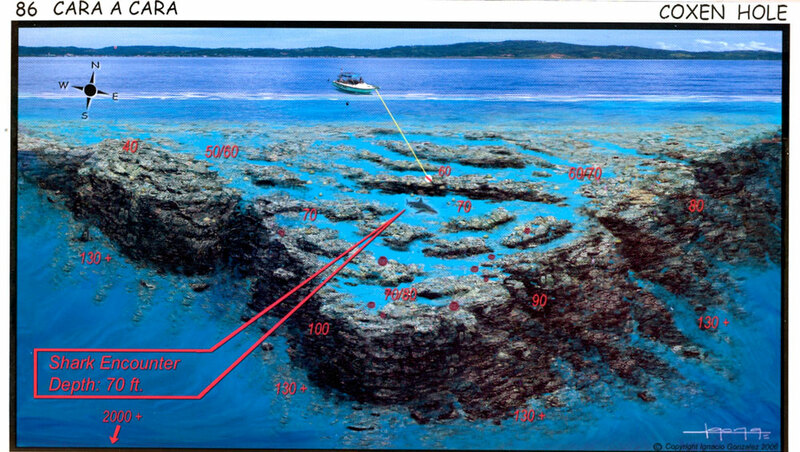 Exploration inside the wreck is possible if some case. Murray eels and big grouper are habitant of the wreck. For canyons lovers this is the perfect spot. 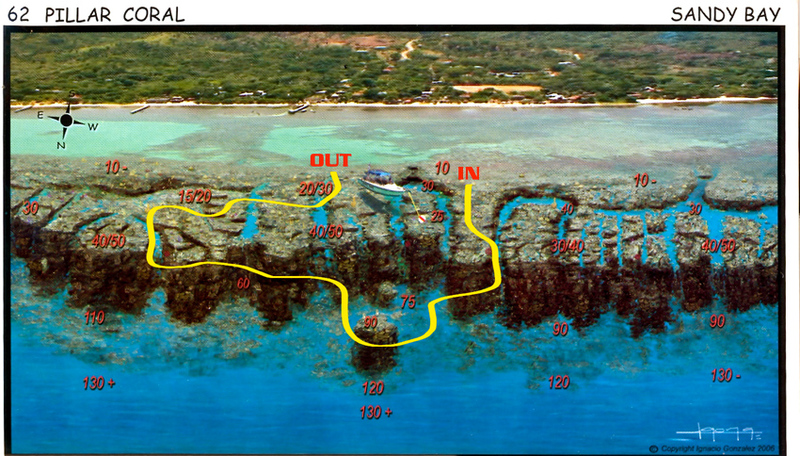 More then 10 different canyons that goes from 80 ft to 15 ft are the main characteristic of this amazing dive site. Probably the funnies dive in the area, planty of marine life like lobsters and king crabs.Schools of Blu tang are patrolling this reef every day. The name says it all, this dive site is famous for his huge concentration of sea turtles, our dive guide counted as many as 30 during a single dive. 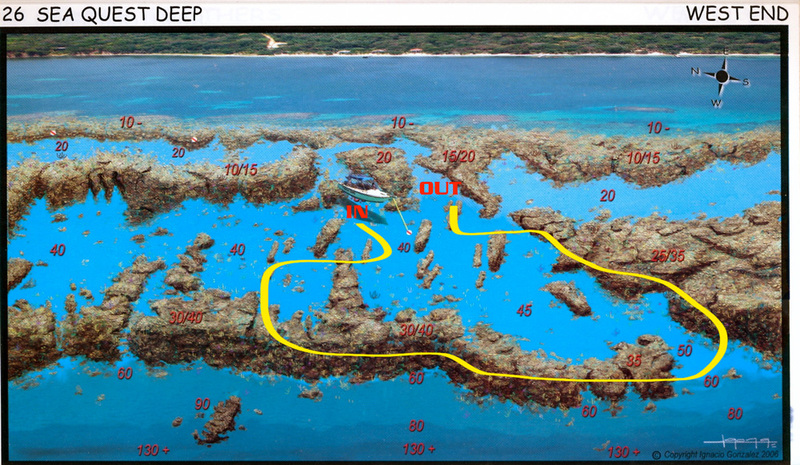 reef formations and huge sponges are also characteristic of this dive spot.